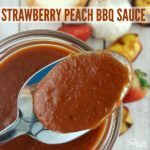 Strawberry Peach BBQ Sauce is the most aromatic and delicious sauce you’ll have all grilling season! 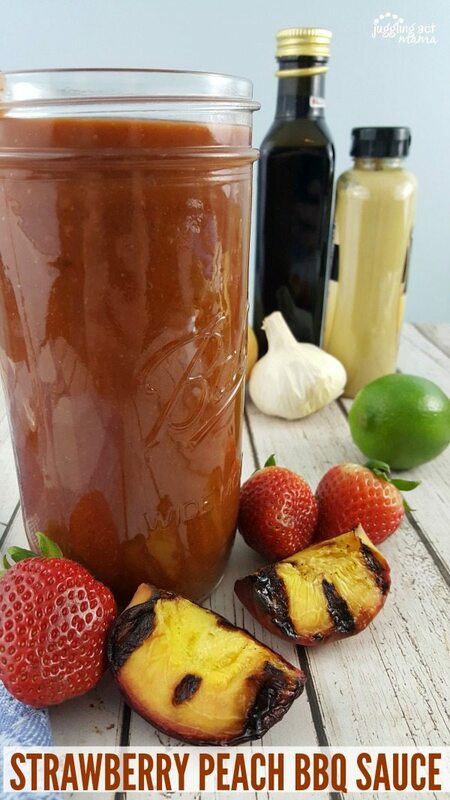 Our Strawberry Peach BBQ Sauce recipe is a delicious alternative to traditional barbecue sauces, but don’t be fooled by the fruit, this sauce packs a punch of spice and a little heat thanks to the chipotle in adobo. One of my favorite things about developing recipes is cooking alongside my family. This recipe was developed with help from my husband. He’s the Grill Master in our house. We have been together for 21 years and I’m happy to say that sometimes he still surprises me. 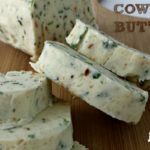 I love including his ideas in the recipes that I share here. We spent almost a full day developing and testing this recipe to make it perfect. It’s not too sweet or too spicy. When you think of strawberries and peaches, you tend to think of desserts or breakfast foods, right? 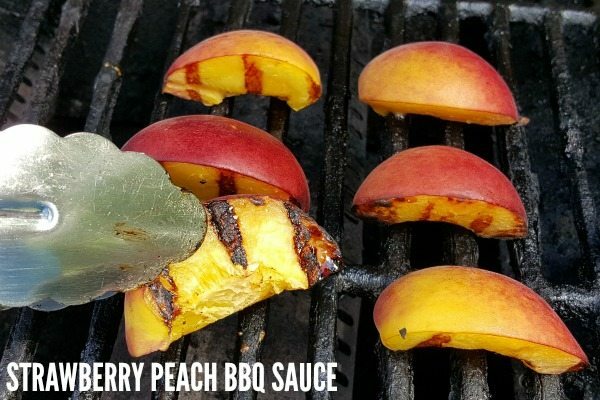 This strawberry peach BBQ sauce will change the way you think about these fruits. The sauce is thick and rich, but not overly sweet. Because of the chipotle chili in adobo, there’s a delicious hint of smoke and just the right amount of heat. It is truly delicious on chicken and pork especially. Cut peaches along the seam all the way around until you can twist the two halves off the pit. Brush the cut sides with vegetable oil. For good measure, also brush your grill with oil. For beautiful grill marks, do not move the peaches for 3-4 minutes. Turn the peaches to cook the other cut side. Remove from the grill with tongs and let cool before removing the skins. The kids were kind of amazed that we were putting fruit on the grill! It was fun to talk about different ways to prepare and eat fruits and vegetables, especially when they are in season and abundant. What Can I Substitute for Chipotle in Adobo? The first time you make any of my recipes, I suggest you do it just as I’ve laid out for you. These recipes have been tested and we know what works well. Chipotle in Adobo comes in a can. The chipotle peppers are smoked and dried. Then they are mixed in a sweet and tangy red sauce that includes tomato, vinegar and seasonings. The flavor is smoky and a little spicy, but not overpowering. But… if truly have to substitute Chipotle in Adobo, here’s what you can do: mix a tablespoon of tomato paste with a tablespoon of cider vinegar. Mix in 1 teaspoon chipotle powder, 1/2 teaspoon of cumin, along with a pinch each of garlic powder and salt. Mix well to combine. 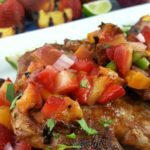 Our Strawberry Peach BBQ Sauce recipe is a delicious alternative to traditional barbecue sauces, but don't be fooled by the fruit, this sauce packs a punch of spice from chipotle in adobo. Preheat the grill to approximately 425-degrees F. Wrap a small tray with tinfoil and spray lightly with cooking spray. Add the prepared strawberries and cook over indirect heat on the grill until the strawberries begin to caramelize, about 3 minutes. You may want to stir and cook 1-2 minutes more. Spray the grill over direct heat. Brush the peaches with olive oil for good measure and place the peach halves on. Grill 3-4 minutes per side, then remove and let cool so they can be handled. Over medium high heat, add the olive oil to a small saucepan. Cook the onions until tender, about 4-5 minutes. Add the ketchup, maple syrup, strawberry and peach preserves, balsamic vinegar, chipotle in adobo, garlic, ginger, and Dijon mustard. Whisk to combine. Remove the skins from the peaches and roughly chop them. To the sauce pot, add the strawberries and peaches. Bring to a boil then reduce heat and simmer 5-6 minutes. Use an immersion blender to puree the mixture. Use as a marinade or serve on the side for dipping. Store in the refrigerator for 7-10 days. I like to use a mason jar with a tight lid. If you’re short on time, but still want to try this Strawberry Peach BBQ Sauce, use our semi-home shortcut recipe. Select a store-bought BBQ sauce. Grill the peaches and strawberries according to the recipe above. Put the fruit and BBQ sauce into the food processor. Add in the chipotle chili in adobo. This is the Food Processor that I use. It is inexpensive but works great, and it doesn’t take up too much space on the counter. What Proteins Go Well with Peaches? 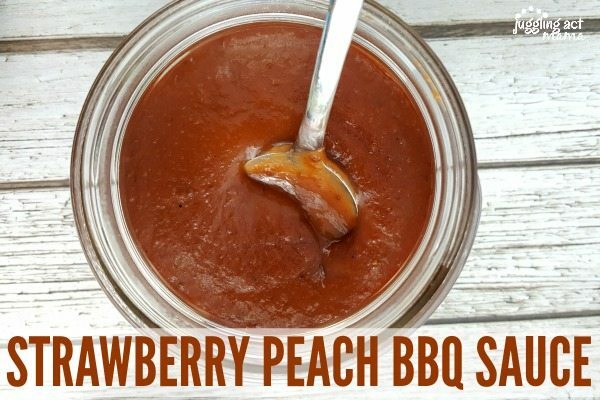 Holy smokes, strawberry peach BBQ sauce sounds so seriously delicious. Sweet and spicy? Yes please! We just got a new grill and now we grill all the things. And now I want to put strawberry peach BBQ sauce on everything. Yum! Stay tuned for a delicious pork recipe coming soon using this BBQ sauce – so amazing! 🙂 Thanks for stopping by! Wow that sounds pretty amazing! 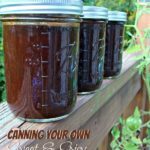 I’ve never made my own BBQ sauce before but I think I need to try this! Oh yay! I’d love to see a new pork recipe also! Omgosh, adding grilled fruit to BBQ sauce is so smart. I have no doubt that this is amazing. Thanks for sharing your recipe with us at Merry Monday this week! I LOVE homemade sauces and this looks so spectacular. I know grilling those peaches takes it right over the top. It’s grilling season here in Cali and I’m looking forward to giving this a try!!! Thanks Deb! I hope you will enjoy!